It was mid-July when we entered southeastern Oregon at the cowboy town of Lakeview on the Oregon/California border along shores of huge Goose Lake. From here the high deserts of southeastern Oregon stretch far, far away; as far as the eye can see, and then far beyond that, forming one of the largest wild areas in the conterminous United States. This is a land of remote, deep canyons, vast sage-covered plateaus, and high desert mountains. Wild rivers flow through the Owyhee Canyonlands while Steens Mountain rises almost 10,000 feet high in the middle of it all. This is Oregon’s Outback. We moved into an Oregon State Park, Goose Lake, to rest up in this quiet, shady oasis just fourteen miles south of Lakeview for $22/night. The back-in campsites easily accommodated our twenty eight foot-long fifth wheel trailer and the park was almost empty. There is 20-amp electrical service (bring an adaptor and a surge protector is recommended) and water connection (bring a filter and pressure regulator – pressure varies and water slightly cloudy). There’s a community bathroom with flush toilets and free showers. Campsites don’t have sewer connections, but the park has a dump station with a separate potable water source to fill our fresh water tank. We had a weak AT&T cellular signal which we amplified with our cellular signal booster. It was a perfect place to prepare for The Outback. Lakeview is the only town of any size for many miles around, so we spent our first day filling propane bottles, grocery shopping, making minor repairs, and most importantly, doing laundry (at one of the filthiest laundromats we’d ever seen). We spent a second day just relaxing in our lounge chairs around the meadow, reading or hiking to the lake. Then, it was time to grind up the 2,000-foot elevation into the Hart Mountain National Antelope Refuge and into the high, sage land plateaus of the Oregon back country. Our goal was to camp in Hart Mountain Antelope Refuge, then move on to Steens Mountain and then move on into the remote Owyhee Canyonlands. But the Hart Mountain Campground was a hot, sage brush flat with no shade, so we moved on. We crossed the high, empty plateaus of the refuge on well-graded gravel roads for fifty miles watching pronghorn antelope trot across the grasslands until we reached the tiny settlement of Frenchglen along the southern edge of the Malheur National Wildlife Refuge at the base of Steens Mountain. Here there is a gas station, tiny store and the small, early twentieth century, Frenchglen Hotel. We fueled up the thirsty truck with diesel (surprisingly inexpensive at $3.75/gallon), made reservations at the hotel for dinner the following night, then drove fourteen miles across more gravel roads to the Bureau of Land Management’s, Page Springs Campground at the base of Steens Mountain. Set in a shallow valley of basalt cliffs with the Blitzen River running through it, Page Springs made a perfect base for us, and it’s the only decent campground in the area. 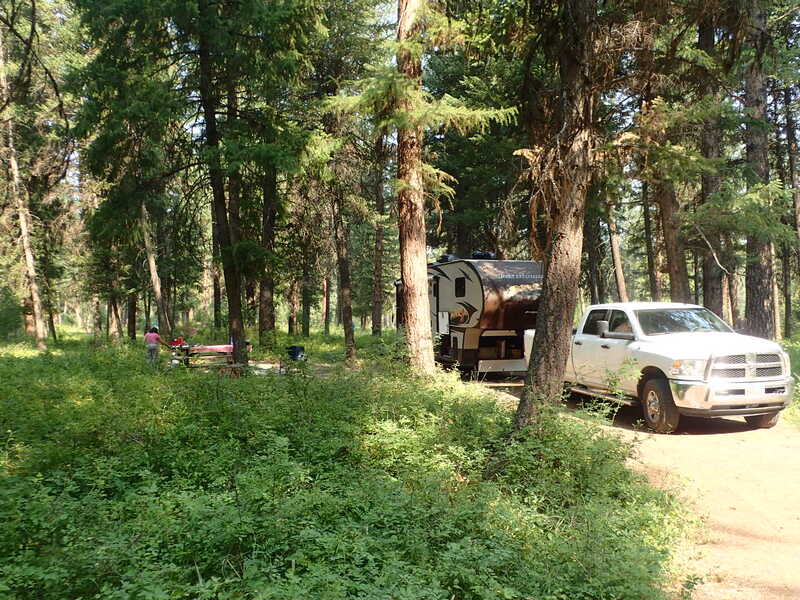 The widely separated campsites easily accommodated our trailer, although finding a shady spot was challenging. We found one, but the mosquitoes were there too, lots of them. No electrical or sewer services, but a strong cellular signal and water at community spigots and clean vault bathrooms. Camping fees were only $8/night, but we paid $4 with my America the Beautiful senior pass. What a bargain! This would be our home for the next four nights. From our base at Page Springs we drove the Steens Mountain Loop, a spectacular dusty, gravel route to the crest of the mountain and then back down glacier-carved canyons. Steens Mountain is deceiving. Viewed from the west it just looks like a large hill until you start ascending it. It rises higher and higher at a gentle upsloping grade, for miles and miles, through aspen forests and finally into open tundra where snow lingers into late July. Then, the slope ends abruptly in spectacular cliffs overlooking the empty playas of the Alvord Desert thousands of feet below. As we drove back towards our camp from The Steens we startled a small herd of the famous Kiger Stallions basking in a water hole in the desert. These wild horses roam freely across the plateaus around Steens Mountain, descendants of the original horses introduced from early explorers. 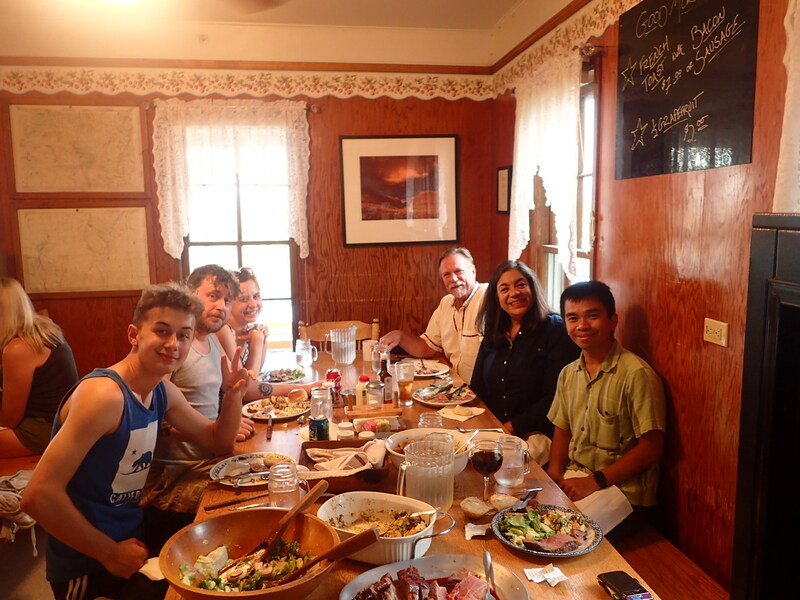 After returning from The Steens we showered in the trailer and went for our dinner at the old Frenchglen Hotel to feast on a family style dinner served at a community table with other travelers; big serving bowls of roast beef and potatoes and pumpkin pie dessert. It cost us $25/plate, but we like to splurge now and again. Full, we returned to our trailer as the sun set and coyotes started howling in the hills. We turned in early. We were tired. Over the next few days the temperatures rose into the 100’s and we decided to leave exploration of the Owyhee Canyonlands for a cooler time of year, September maybe. Besides, the mosquitoes seemed to have multiplied with the increased temperatures. So, after relaxing at our shady camp at Page Springs for a couple more days we moved north, into central Oregon. We decided to visit friends in Bend, Oregon and traveled through the John Day Fossil Beds National Monument, stopping at the strange Painted Hills on the way. But, Bend was hot, crowded and cloaked in a choking cloud of forest fire smoke. We camped one night along a U.S. Forest Service road and left early the next morning. It seemed we couldn’t escape the forest fire smoke no matter where we went. In a few days we had an appointment at Thunder RV in La Grande Oregon to repair our trailer (I’d run into a concrete post in the California Redwoods ripping a big hole along the bottom of the trailer). So, we decided just to go there to wait for our appointment and hopefully escape the smoke covering the rest of Oregon. But as we drove from Bend towards La Grande even the Columbia River was covered with smoke, and as we crossed over the Blue Mountains outside of La Grande it got worse. We could taste the smoke, it burned our eyes, and there was nowhere to escape it. We were getting desperate, kicking ourselves for having left the clear skies at Steens Mountain, when we turned off outside of La Grande onto rural highway 244 to find somewhere to camp for the next few days. We passed a couple of small state parks, crowded and noisy, and then found Bird Track Springs, a primitive U.S. Forest Service campground just fourteen miles outside of La Grande. We had found an oasis. Bird Track Springs has no services, no water, no dump station, no cellular signal, just a couple of vault toilets. But, the air was noticeably clearer and the campground was almost empty, set in a cool, shady forest of pine and tamarack. It cost $5/night, only $2.50/night for us with my America the Beautiful senior pass. This was a perfect base for us to wait for the trailer repairs and explore the area. We relaxed here in our comfortable camp until August 8th and our appointment at Thunder RV for our trailer repairs. Along with replacing the damaged skirting we were exchanging the cumbersome recliner chairs in the rear of the trailer for a compact folding couch and repairing the rear stabilizers which had stopped working. We dropped the trailer at the dealership and drove the truck into La Grande to do laundry. At the laundromat we met Linda unloading her old Volkswagen Vanagon and, noticing the Maine license plates on her van, starting talking to her. Like us, she and her husband Rick had sold their house and started traveling in the spring. Rick had landed a summer job with the U.S. Forest Service as a forest fire guard in a fire lookout tower high in the Blue Mountains. She invited us to the tower for a visit and the next day we hiked up to it and spent the day visiting with them in their “home” perched on top of a wooden tower high above the surrounding mountains. In the evening we picked up the trailer from Thunder RV. They had done an excellent job and it looked like new. Now we were ready to move on. Since it was still smoky in the La Grande valley we decided to return to the Owyhee canyon lands to escape the persistent forest fire smoke and after another relaxing night at Bird Track Springs we drove four hours south through the canyons and deserts to Owyhee State Park outside of Ontario Oregon along the Idaho border. Owyhee State Park is set in a spectacular canyon, but the park was crowded. It turns out this is a big fishing area and the park was crowded with motorboats and motorhomes. The park has two small campgrounds with electrical and water connections, bathrooms with showers, and a RV dump station for $22/night. We stayed only two nights, but spent a day exploring the magnificent canyons south of the park with just the truck. We drove the miles of gravel roads through Succor Creek State Recreation Area, a small canyon with spectacular basalt pinnacles all around it and a small, primitive campground. State brochures said RVs and trailers couldn’t maneuver through the narrow roads in the canyon, but I could see that we could have towed our fifth wheel trailer there, carefully, especially if entering from the south. We drove on to Leslie Gulch, a truly magnificent place. The gravel road drops down from the grassy highlands into a narrow canyon full of basalt pinnacles and side canyons with the rocks colored in reds, purples, blues and yellows. The road was narrow and rough, but we could see that we haul our fifth wheel trailer down it, very carefully. 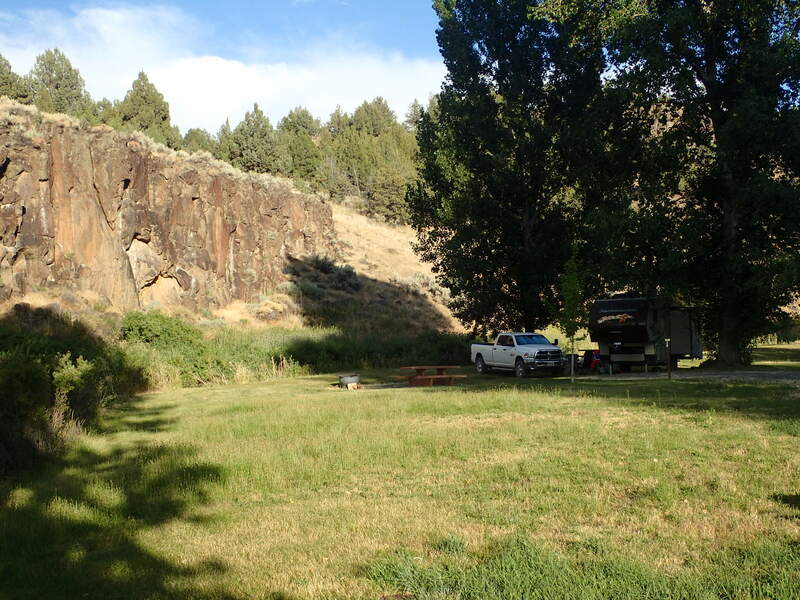 At The bottom of the canyon is the small Slocum Creek Campground, a primitive Bureau of Land Management camp with no water, no shade, no cellular signal, and no services, but on the shores of Lake Owyhee and, . . . free. It was hot and I swam in the cool lake before leaving. We agreed that we would return to stay here in the spring when the weather was cooler. This special place was now on our “return to” list. We returned to Lake Owyhee State Park, but we were disappointed with our camp there and left early the next morning driving all the way back to La Grande and our quiet camp at Bird Track Springs. From there we left for Kennewick, Washington where we rested up at our friends John and Lorie’s ranch for almost two weeks. At John and Lorie’s we watched the solar eclipse (about 97% complete in Kennewick). 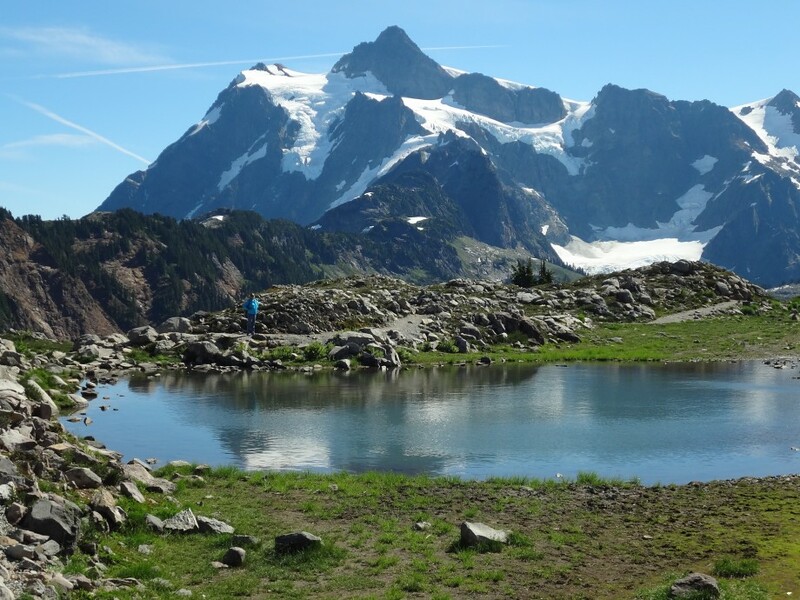 John and I spent a couple nights backpacking deep into the Alpine Lakes Wilderness, camping under the glaciated peaks of Mount Daniel. We visited friends, made minor repairs to the trailer, and re-supplied, preparing to continue on towards the Rocky Mountains and Yellowstone National Park. It was the end of August and fall was already in the air. Time to move on. So, we left our comfortable site at John and Lorie’s ranch and drove off towards Oregon’s Wallowa Mountains, our first stop en route to the Rockies. We were hoping to reach Yellowstone by mid-September; after the busy Labor Day holiday but before the first winter snows began to fall. Winter comes early in the Rockies. Time to move on.